Learn Spanish at the Centre “CHISPA”! The Centre “CHISPA” in Kiev offers a wide variety of courses to prepare for official exams, develop specific language skills, learn more about different aspects of culture, courses for children and courses with a focus on language for professional needs. Our highly qualified tutors are excellent trainers who offer the chance to increase capabilities and expand skills horizons. Emphasis is placed on spoken communication and interaction; this is achieved through pair and group work, simulations and role-plays, and is supported by systematic work on grammar, vocabulary and pronunciation. In addition to our general Spanish courses we offer a wide range of more specific courses such as Spanish online courses; courses to prepare for the DELE Spanish official exams, business Spanish; conversation courses; Spanish for children; and teacher training courses. Other courses and private and corporate tuition are also available on demand. If you love the Russian or Ukrainian language and you want to study it, this is your place: We offer you lessons from the basic to the advanced level. 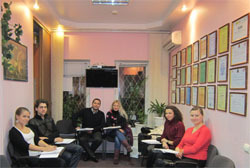 Rates for one-to-one tuition start at 200 hrn.) per hour. Lessons usually last one or two hours. We recommend 1½ hours as a minimum lesson length, so a typical timetable might be 2 lessons of 1½ hours per week. But many students study more intensively. For further information or to enrol, please contact us on (+38044) 501-75-77.